Haruki Murakami turns in a trademark story that blends the commonplace with the nightmarish in a Japan full of hollow men. 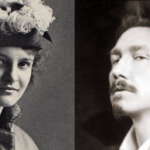 ...in Colorless Tsukuru Tazaki and His Years of Pilgrimage, the Kafkaesque spectre in the text is The Trial ... The majority of the narrative involves the protagonist's quest – which takes him as far as Finland – to understand the reason for his ostracism ... A reader without Japanese is completely at the mercy of Murakami's translators; when the prose lowers to cliche or commonplace – as it seems to do surprisingly often in this novel... Although as adept as ever at setting up Kafkaesque ambiguity and atmosphere, he disappointingly chooses to leave most of the mysteries unresolved. Haruki Murakami's Colorless Tsukuru Tazaki and His Years of Pilgrimage begins with a simple premise: A Tokyo railroad engineer, the Tsukuru Tazaki of the novel's title, unable to get over the summer of his sophomore year in college, when for no reason he can determine he was cut off by his close-knit group of high school friends ...a rawness, a vulnerability, to these characters, a sense that the surface of the world is thin, and the border between inner and outer life, between existence as we know it and something far more elusive, is easily effaced ...a novel less of wandering than of integration, although what this means is difficult to pin down. Does Tsukuru come to any kind of closure? The answer is: Yes and no. The past, even revisited, can never be reclaimed. 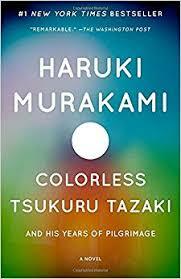 ...what intrigued me about his latest novel, Colorless Tsukuru Tazaki and His Years of Pilgrimage, is that it's explicitly about that blankness. He cops to the emptiness of his hero right up front... By delving into the past, Tsukuru delves into his own blankness to see how deep it goes, what it means and what it might be concealing ... Tsukuru does find out why his friends turned on him, but I won't spoil it. The question is whether in the process he becomes a whole person. Murakami tells us he does — but I'm not convinced. Tsukuru excavates a mountain of drama and backstory out of his blankness, but he still stares at it just as blankly. What did you think of Colorless Tsukuru Tazaki and His Years of Pilgrimage?